[ Sir Roderick Murchison, Scottish geologist. ] Autograph Note Signed ('Rod. I. Murchison') to Sir John P. Boileau, inviting him to dine with 'M. Quetelet' and 'one or two friends'. On letterhead of 16 Belgrave Square, S.W. [ London ] 17 July 1860. 1p., 12mo. In good condition, on lightly aged paper with minor traces of glue at head. Addressed to 'Sir John P. Boileau Bt.' Reads: 'My dear Sir John, | If you are disengaged on Friday next I wish you would gratify me by dining with us "en petit comité" to meet M Quetelet & one or two friends'. 'M Quetelet' is the Belgian astronomer Adolphe Quetelet (1796-1874), founder of the Brussels Observatory. [ Sir Henry Ellis of the British Museum and Leonard Horner of the University of London. ] Autograph Note Signed from Horner to Ellis, requesting a Reading Room ticket for 'Mr Phillips', with Ellis's signed autograph refusal. Horner's Note from the University of London, 11 February 1830. Ellis's reply without place or date. 1p., 12mo. Heavily aged and worn, with closed tear along fold line at head, and remains of mount on reverse. Horner's note, on the upper part of the paper, reads: 'Dear Sir | Be so good as admit Mr Phillips to the privileges of the Reading Room at the British Museum - | Yours faithfully | Leonard Horner | University of London | 11 Feby 1830'. Beneath this Ellis has written: 'My Dear Sir | Mr. Phillips can be admitted at the Age of Eighteen, but is not eligible for our Reading Room at present | Ever faithfully Yours | H. Ellis | L. Horner Esqr'. [ Archibald Geikie, Scottish geologist. ] Autograph Letter Signed ('Arch Geikie') to a female student of geology, correcting the misidentification of two specimens. On letterhead of Shepherd's Down, Haslemere, Surrey. 24 October 1907. [ Sir Joseph Prestwich, geologist. ] 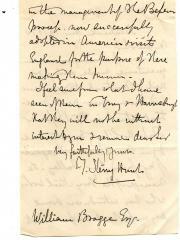 Autograph Letter Signed to 'Gustave', i.e. Victor Gustave Plarr, regarding 'Pebbles of white quartz'. On letterhead of Darent-Hulme, Shoreham, Sevenoaks. 6 June [ no year ]. 3pp., 12mo. Bifolium. In fair condition, lightly aged and worn. He thanks him for a copy of his 'papers', 'though I regret to say they are sealed books to me'. He explains how 'Pebbles of white quartz are originally derived from veins in the metamorphic rocks by marine action. They may occur in any formation & are common in many.' He describes the locations where they are to be found, before sending his and his wife's regards to Plarr and his wife. [ Professor William Thomas Gordon of Kings College London, Scottish geologist. ] Autograph Letter Signed ('W. T. Gordon') to 'Mr. Joy', expressing condolences on the loss of a daughter, and grief at the recent death of an uncle. On leterhead of the University of London, Kings College. 5 May 1930. 2pp., 12mo. 29 lines of closely-written text. In good condition, on lightly-aged paper. 'Such a calamity must be a terrible blow for you all but more especially to Mrs. Joy and yourself. To lose a daugher just blossoming out into womanhood is tragic indeed, the more so, if that were possible, in that she was such a bright girl.' He continues 'By the same post I have word that one of my uncles has just died, and that another has been given up by the doctors. They have both lived full lives, and, in their way, interesting lives, so that, there, one can hardly talk of a tragic end. [ Sir Humphrey Sumner Milford, publisher to the University of Oxford. ] 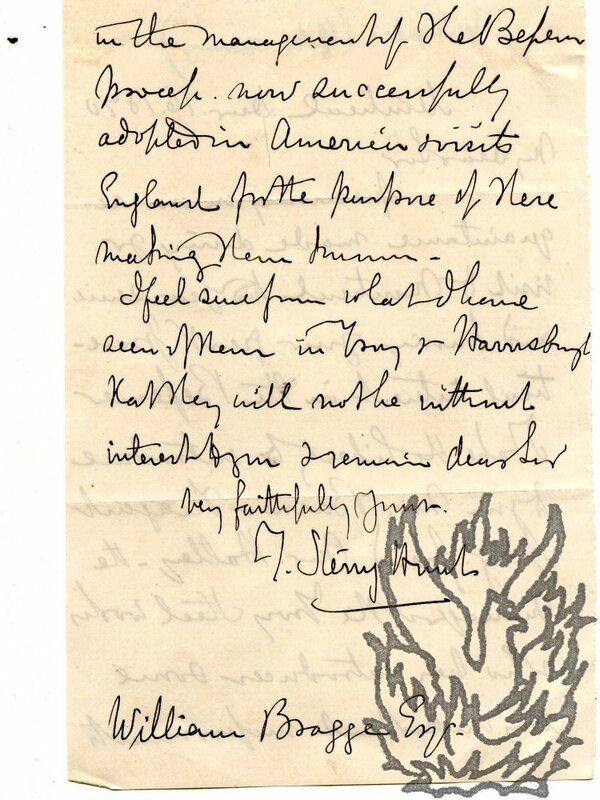 Autograph Letter Signed ('Humphrey S. Milford') to George Ravensworth Hughes, son of Thomas McKenny Hughes, Woodwardian Professor of Geology, Cambridge, regarding his wedding. On letterhead of Oxford University Press, Amen Corner, London. 12 March 1917. 2pp., 12mo. Bifolium. In very good condition, lightly aged. Had he known that Hughes's wedding was 'coming off so soon' he would have been 'in time with a little gift'. As it is, he asks him to choose for himself, 'with the aid of your wife': 'Are you and she sick of the Oxford Books of Verse? Is Shakspeare's England too weighty (avoirdupois) for war-time establishments? W.S. Dallas [ William Sweetland Dallas ], zoologist. One page, 12mo, good condition, tipped on another peice of paper with unrelated notes on verso. Note (Wiki) "He curated collections at the British Museum and the Yorkshire Philosophical Society, and was editor of the Popular Science Review. [Thomas George Bonney, geologist.] Autograph Letter Signed ('T. G. Bonney') to an unnamed male recipient, commending his 'interesting paper', and discussing the 'Lafoten rocks', with reference to a conversation with 'Mr Dahl'. 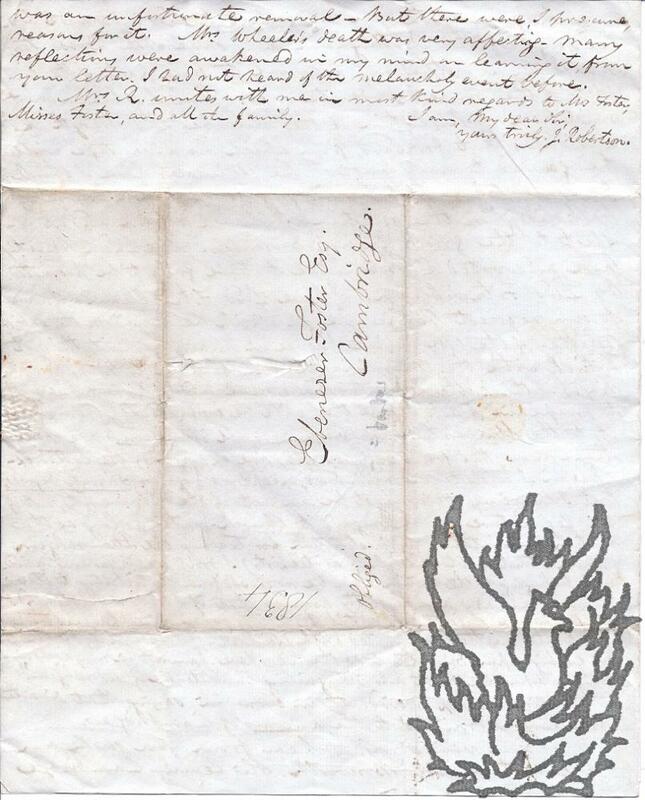 On letterhead of St John's College, Cambridge. 20 February 1871. Broomfield, Sheffield. 26 November 1856. 3pp., 12mo. Bifolium. In good condition, on lightly-aged paper. The letter is addressed to 'My dear Forbes' , and while there is a possibility that it is addressed to David Forbes, the reference to the recipient being 'still in existence' suggests James David Forbes, who had been in bad health since his return from Norway in 1851. It begins: 'Only a few days before receiving your note we had been talking of you and wondering if you really were still in existence, for we had heard nothing of you in any way for so long. Extracts from the East Kent Gazette, the Sheerness Times, the Proceedings of he Geological Society of London, and the Rochester & Chatham Standard; dating from 1894 and 1895. Shrubsole was a frequent contributor to the Manchester Guardian, and its obituary of 21 May 1927 was headed 'DEATH OF GREAT SHEERNESS GEOLOGIST WHO WON FAME THROUGHOUT THE WORLD' ('Experts in every continent sought his wonderful advice, and it was during his researches at Sheppey that he made many valuable discoveries. Below we are able to give a detailed account of his brilliant career. He was a frequent contributor to the columns of the "Guardian" up to the time of his death.'). 3pp., foolscap 8vo, in a bifolium. Printed in three columns of small print. Autograph Note Signed ('Arch Geikie') from the Scottish geologist Sir Archibald Geikie to 'Dr. Lyndon' [Dr Arnold Lyndon], who has attended on him. On letterhead of Shepherd's Down, Haslemere, Surrey. 1p., 12mo. Good, on lightly-aged paper. He is enclosing a cheque in payment of Lyndon's fees, 'and with best thanks for your kind attention'. Autograph Letter Signed, J. Robertson, vicar, to Ebenezer Foster, banker, Cambridge, chatty about Adam Sedgwick and other aspects of Cambridge intellectual life. Four pages, 4to, fold marks, closed tear, mainly good. He's taking advantage of a trip by one of his parishioners to deliver a letter thanking in fulsome and inventive terms Mrs Foster for sending Professor Sedgwick's Discourse. He says of it, Of the talent and temper of the orator only one opinion can be formed. For the Studies of the University [A Discourse on the Studies of the University] he is not responsible, but for his representation of them the University owes him thanks. 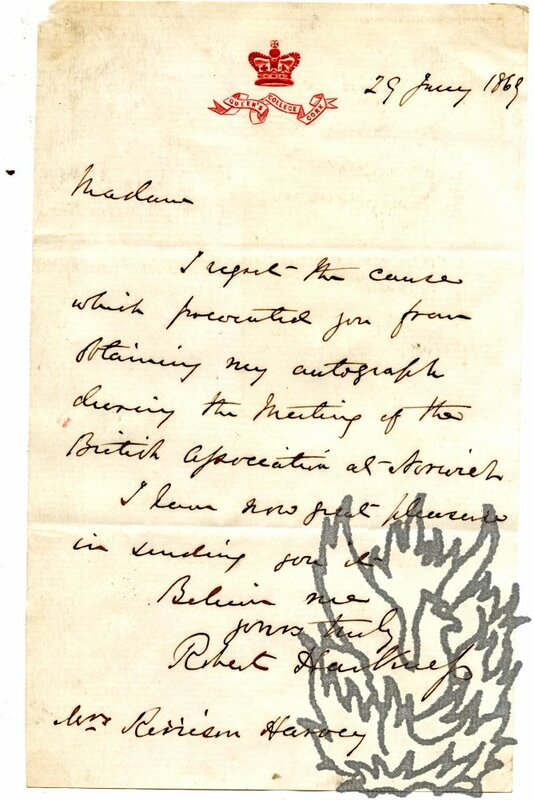 Autograph Letter Signed T. Sterry Hunt, American geologist and chemist, to William Bragge, physicist, on improvements to the Bessemer process (steel) and an American visiting Britain for steel-related business..
Two pages, 12mo, good condition. He presumes on the acquaintance struck up when Bragge was in Montreal two years previously and knowing your great practical interest in the Bessemer I take the liberty to introduce to you Mr [Barner?] the agent of my friend Mr Holley - the manager of the Troy Steel Works who has introduced some very important improvements in the management of the Bessemer process, now successfully adopted in America & visits England for the purpose of there making them business. Eight Autograph Letters Signed (all 'William. G. Fearnsides') to Sir Henry Trueman Wood (3) and G. K. Menzies (3), Secretaries, Royal Society of Arts. Between 30 January and 28 November 1917; all on letterheads of the Department of Applied Science, St. George's Square, Sheffield. 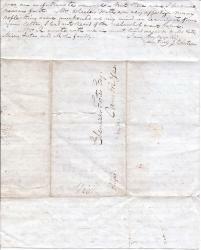 All eight letters in very good condition, on lightly-aged paper. Seven carrying the Society's stamp. The correspondence relates to a Howard Lecture by Fearnsides before the Society on 30 April and 7 May 1917. 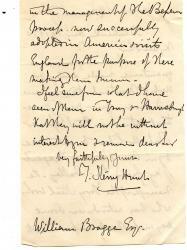 Autograph Note in the third person, with signature ('Harry G Seeley | Assistant to Professor Sedgwick'), to Kerrison Harvey, containing a humourous flight of fancy regarding dinosaurs. 24 February 1869. On letterhead of St John's College, Cambridge. 12mo, 3 pp. Bifolium. Fair, on lightly-aged paper with thin horizontal strip of discoloration caused by glue from mount on blank reverse of second leaf. 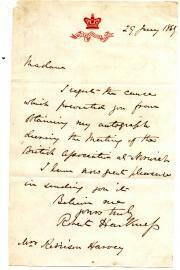 Autograph Letter Signed to Mrs R<?> Harvey. 29 January 1869; on letterhead of Queen's College, Cork. 12mo, 1 p. Fair, on lightly-aged paper, with slight damage to one corner from removal from mounting, small glue stains from which are evident on the reverse. She was prevented from obtaining his autograph 'during the Meeting of the British Association at Norwich', and he is sending it to her now. On piece of aged paper roughly one inch by one and a half inches wide. Signature, underlined and overlined, less than an inch long. Autograph Letter Signed in French to the Abbé [François Napoléon-Marie] Moigno (1804-1884). 15 September 1855; 35 Avenue d'Antin, Paris. Canadian geologist (1826-92), Fellow of the Royal Society. 2 pages, 8vo, in good condition but with minor loss to one corner resulting in loss of part of one word of text. The recipient Moigno has been described as a mathematician and scientific vulgariser. Sterry-Hunt received Moigno's note the previous morning and regrets that he will be unable to meet him as he leaves on Monday for a 15-day tour of the Rhine and Alsace.